Confessions of a Ribbon Addict: It's Teaser Time! Hello everyone and welcome to the start of MFT Teaser Time! On August 4th, there will be a NEW release and it is packed with MFT goodness! 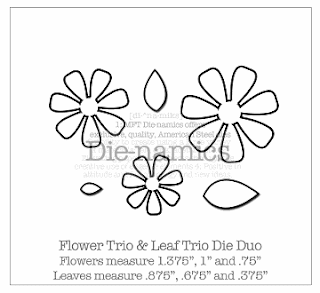 14 stamp sets, 4 new Die-namics, a new Triple Scoop Set, 4 Templates (one from me! ), new felt, and SO much more! Today, we are previewing 2 new stamp sets: Clearly Sentimental about Gardens & How Your Garden Grows. Each day, there is at least one new stamp set being given away on a designer's blog. To be eligible to win, you'll need to have commented on that designer's blog for that particular day. Make sense? For your BEST chance to win a set, comment on ALL the teaser posts EVERY day. :) Check Kim's blog every day for the winner(s). You can see a list of all participating designers on Kim's blog at 11 AM EST daily. The release party is on August 4th from 8-10 PM EST in the forum HERE. Now, let's get to the cards! I have a card to share with each set that is being previewed today! By the way... this sentiment is innocent enough, right? Well, when I was stamping this card, I was thinking of all the hilarious things you could do with it: legs sticking up out of dirt, buried remote controls, buried (insert anything you want to oust from your life). Who has the courage? LOL Any takers? *wink* Maybe a fun dirt cake type of thing for Halloween? Put on your thinking caps! My next card used How Your Garden Grows, the coordinating digi paper pack (will release on August 4th) with the same name, AND the Brand Spankin' New Die-namics die set: Flower Trio & Leaf Trio. BOTH dies come in the set for only $11.95. It's a steal. And the leaves are TDF! Let me disclaimer about this card: this card looks WAY better in person than it does on the screen. I have the hardest time photographing bright red/orange. *sigh* PLEASE forgive my poor photography and focus on the cute little image. :) She is adorable and the flowers are too cute. 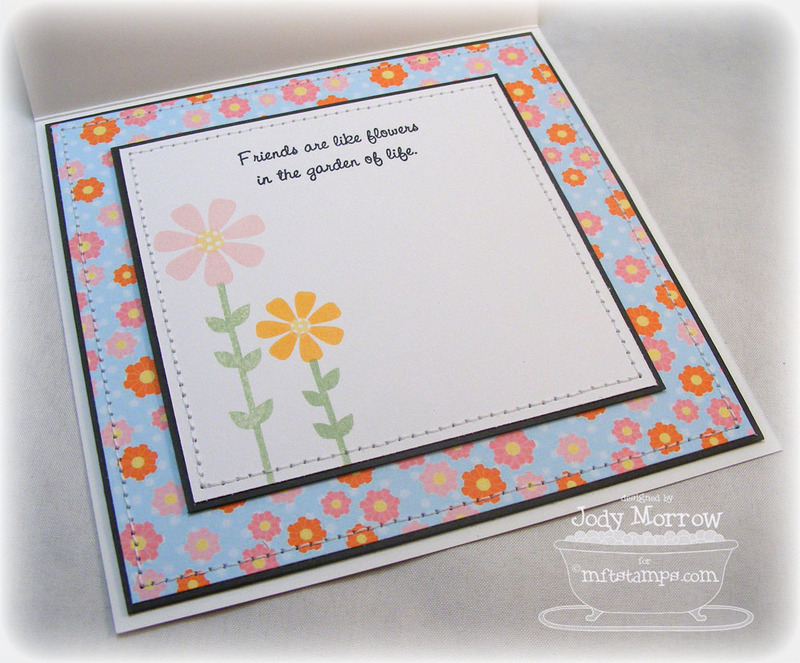 This set also lends itself to cards using just the flowers, which are both solid AND line images. It's super versatile! A peek inside showing you the solid flowers and stems. They will make fun and easy cards! Remember to head over to Kim's blog at 11 AM EST to see the list of participating designers and remember to leave a comment on each one for your chance to win the How Your Garden Grows stamp set! I love your cards they are beautiful. I love the new die too. Teaser is right! I can't wait to see what you have designed for the release. I love your cards! Fantastic cards! I love the first tree one---that's one of my favourite paper lines of all time. that's a nice use of the Origins paper - love the trees and can't wait to see what your template is. 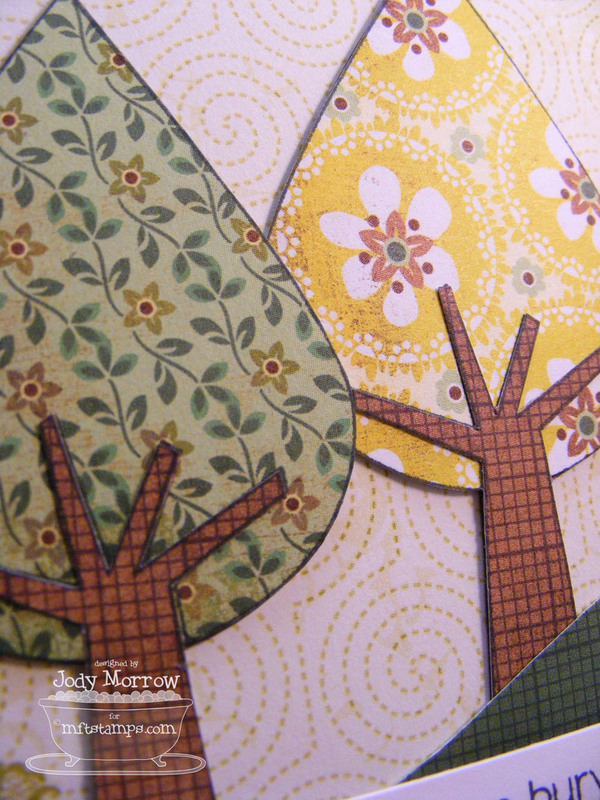 I really like the paper piecing for the trees in the first card. And the button treatment is very different. I want to try that soon. Love both cards. The inside is great...going to have to "steal" that. your cards are AMAZING. Eye candy...each and every one! Love the cards!! Grow Love is one of my favs, too and the sentiment is perfect!! Jody, I agtee with Frances -- awesome cards! I'm particularly drawn to the tree card -- I love trees and suspect I was a druid in a prior life! oh Jody both of these are gorgeous! you so rocked them both! your sewing is to die for awesome and i cannot WAIT for this set or those awesome dies EEEEK! New Die's and felt and stamps, oh my...words I love!! You always rock the Teasers GF! The Grow Love set is one of my all time faves too. Wonderful cards! Love your cards. I really want those dies. I have tried to stay away from making this purchase but it looks like I may have to cave. 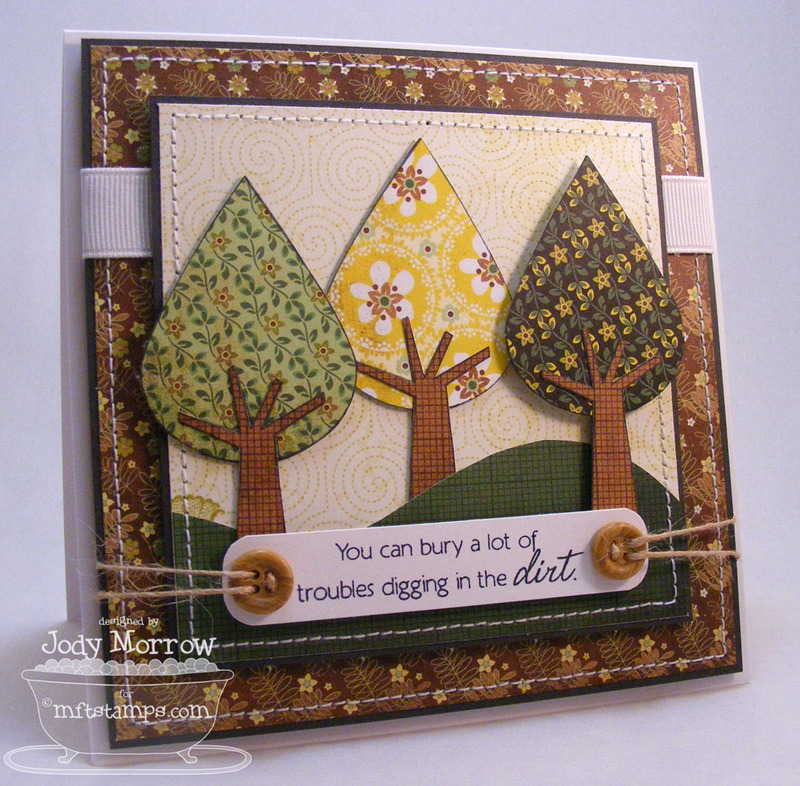 cahute cards Jody, I love that tree set! Goes perfectly with the new sentiment set! OMG! LOVE both of these Jody! The way you attached the sentiment on the first card ROCKS and I ADORE everything about the 2nd card! LOVE the new dies...sigh! So gorgeous! 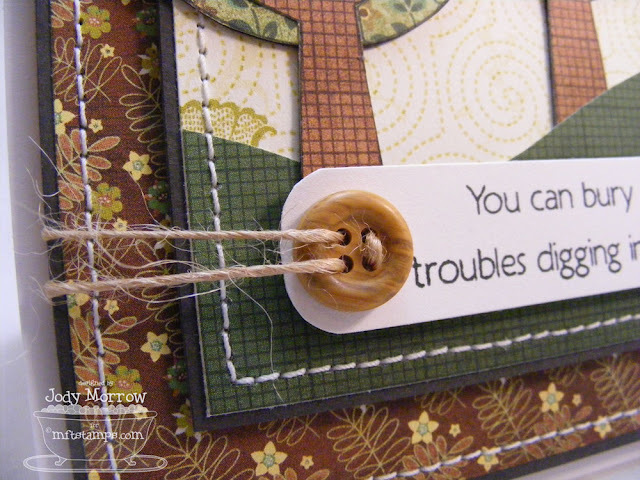 Love the tree card and the saying so hilarious! I love how you paper-pieced the trees! So cute! Aw, what a cute card Jody!!!! love those sweet trees and that button treatment is really cool. adore your sweet flower card, too! Great cards! I really like the trees. your cards are always great, but I have to say the DP you used on the first card on those trees... that's just simply gorgeous! 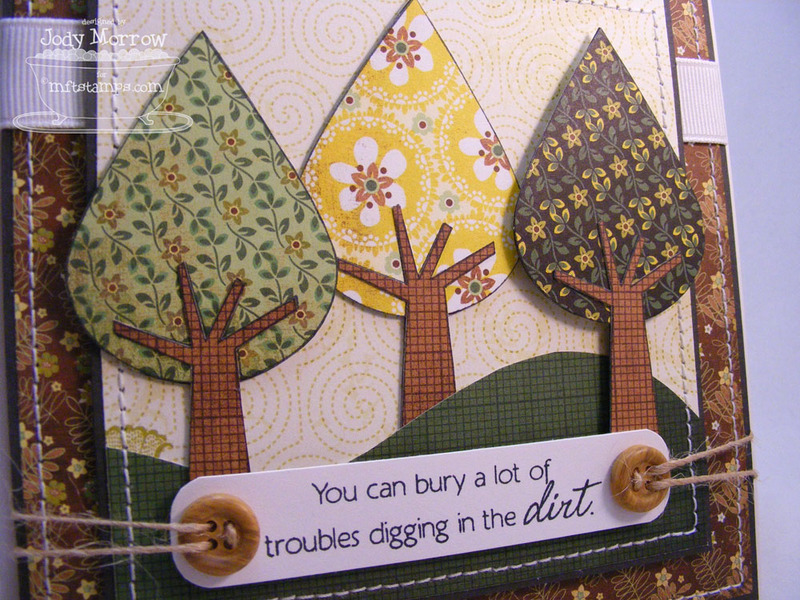 Amazing cards, especially those pieced trees - so awesome! Wow! Both of your cards are stunning - but I love love love the first one! They're both STINKIN' GORGEOUS, but that green one is to dye for! It SO looks like a quilt! Stunning - TFS! I love how you used the tree stamp. the paper piecing is gorgeous. 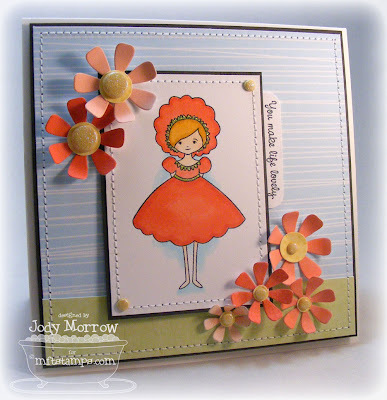 Beautiful cards, Jody! The papers, the buttons, the flowers -- perfection! Love your tree card, Jody, and the second one is fabulous! You know how much I love this set! !